Two tiny moons of Saturn, almost lost amid the planet's enormous rings, are seen orbiting in this image. Pan, visible within the Encke Gap near lower-right, is in the process of overtaking the slower Atlas, visible at upper-left. All orbiting bodies, large and small, follow the same basic rules. In this case, Pan (17 miles or 28 kilometers across) orbits closer to Saturn than Atlas (19 miles or 30 kilometers across). According to the rules of planetary motion deduced by Johannes Kepler over 400 years ago, Pan orbits the planet faster than Atlas does. 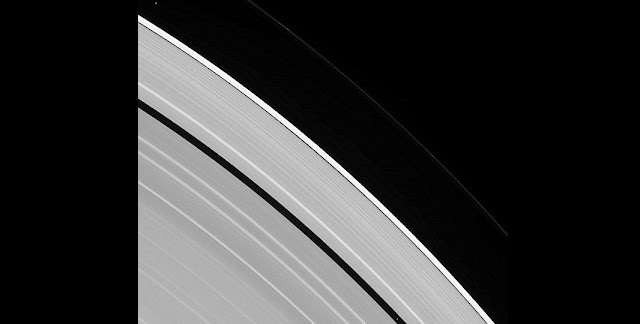 This view looks toward the sunlit side of the rings from about 39 degrees above the ring plane. The image was taken in visible light with the Cassini spacecraft narrow-angle camera on July 9, 2016. The view was acquired at a distance of approximately 3.4 million miles (5.5 million kilometers) from Atlas and at a Sun-Atlas-spacecraft, or phase, angle of 71 degrees. Image scale is 21 miles (33 kilometers) per pixel.